Ali Reza Farahnakian, Francis Benhamou, BabakTafti, Tala Ashe and Heather Raffo in "The Profane." Photos by Joan Marcus. ASSIMILATION is part of the American experience. As socially engrained as we feel, however, we still live within our "tribe." If you are Jewish, you probably grew up surrounded by family and friends of the same persuasion. Italians likely also found themselves in enclaves from the old country. 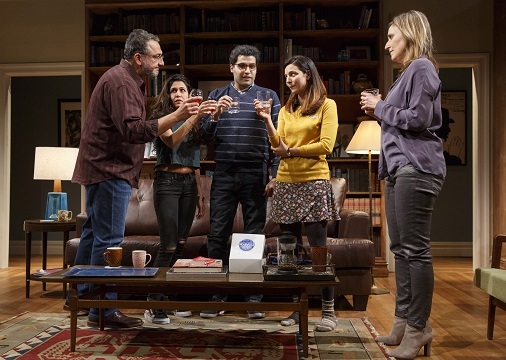 Zayd Dohrn's new play, "The Profane," at Playwrights Horizons in an extended run through 7 May, reconnoiters the two sides to the immigrant experience. Raif (Ali Reza Farahnakian) and his wife Naja (Heather Raffo) are secular and non-observant. The two, particularly Raif, have distanced themselves from Islam. Their eldest daughter, Aisa (Francis Benhamou) lives at home and works late shifts at a bar. It's their younger girl who presents the puzzle to them. Emina (Tala Ashe) is dating a fellow student Sam (Babak Tafti), whose parents are traditional and devout Muslims. Tala Ashe and Babak Tafti are a sort of "Romeo and Juliet" in "The Profane." Emina has looked for - and found -connections, while her father has fled from them. Raif's rush to judgment is based, of course, on his prejudices, which he tells Emina are actually his "experience ... with these people." "These people," Peter (Ramsey Faragallah) and Carmen(Lanna Joffrey,) are welcoming and charming. The sets by Takeshi Kata are both lavish and homey, especially for the small Peter Jay Sharp Theater. They underscore the differences between the families. "The Profane" is unexpected, despite its seeming timeliness. It is brilliant, in fact. ZD has written a play with deep affection and understanding for its characters. 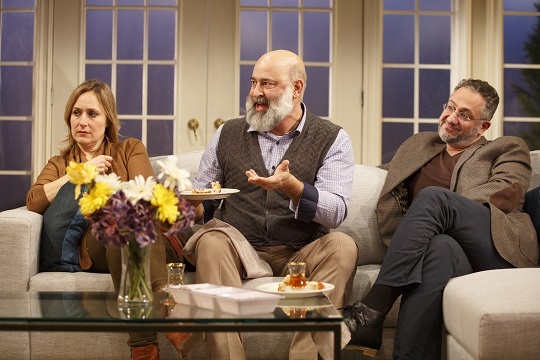 Heather Raffo, Ramsey Faragallah and Ali Reza Farahnakian are slackers in "The Profane." The cast and play thrive under Kip Fagan's well-paced direction. The ensemble is universally mindful of the delicacy of the material and its power to provoke. In all the best ways. Visit http://www.playwrightshorizons.org/shows/plays/profane/ to learn more about "The Profane."